Mivv choose us like official web reseller. This is a guarantee for. Complete final transmission kit sprockets chain pbr ek yamaha yfm660 rle-s raptor ltd ed. 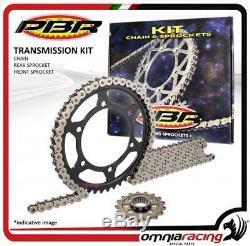 Transmission roller chain kit, front and rear sprocket pbr code ek2820g. The transmission kit pbr it's composed by. Rear sprocket 40 teeth like original. Front sprocket 13 teeth like original. The motorcycles transmission in general is the set of components that have the purpose of transferring the power generated from engine to wheel. It is a mechanical system subjected to great stress and wear, for this reason it is advisable to replace it at intervals of approx 20.000 km. When visually the components are ruined due to poor maintenance. In the production of transmission gears: chains, front and rear sprocket, is a leader in the industry at international level. The components are totally produced in italy. Competence, reliability and durability have made the products among the most popular in the motorcycle industry, private and sporty. Years of research into techniques and materials, the work of skilled craftsmen and the use of industrial technologies for machining the components to an exclusive level. The roller chain transmission (the most used in motorcycle) includes 3 main components. Roller chain: This system gives freedom of movement to the front and back of the chain. Made of durable material at the same time flexible for optimum performance. Various types of ek chains (normal, high-sliding, o-ring, x-ring) are provided in the kit, depending on the type of engine, and correspondingly the most suitable one. In most cases, transmissions are better than the standard ones. Rear sprocket: it is the largest toothed wheel easily identifiable on the rear wheel of motorcycle, it is the rear sprocket to transmit movement. It consists of a variable tooth depending on brand and model of the bike. Made of steel (stronger but heavier) or aluminum (lighter but more consumable). Front sprocket: product component steel, is the smallest toothed wheel, usually not visible because it is covered by a specific cover, is connected to the gearshift shaft, turning in contact with the gears in this way the roller chain is activated and it transfers movement to the rear sprocket moving the bike. Also the front sprocket like the rear sprocket has a variable depending on the model and the brand of the bike. Attention: the pictures of pb / ek transmission kit show indicative image, the product may vary color and design. In 1994, the passion and experience of manufacturing bertollini created omnia racing, with the aim of representing a reference point for everyone fond of bikes. In 2000, when the company joined the competition, the company was founded, a society based on the passion and competence needed to create and trade the top products for motorbikes. Our continuous search for perfection and performance, using advanced technologies, has allowed us to interact with internationally recognized pilots and teams. Our products are excellent for both road and circuit use. They are continually tested by our technicians and pilots, thus improving the dynamics, dynamics and structural features of the materials adopted. The experience gained through the years of the competition has been greatly improved. Accostato, afam, aim, akrapovic, andreani, arrow, bazzaz, bc battery controller, bitubo, bmc, braking, brembo, bst, capit, castrol, derry moto, tuning fork, did, discacciati, eibach, ek, fabbri, far, frentubo , galfer, gbracing, giannelli, gifrap, givi, gopro hero, gpt, h2o, hagon, ixil, jollymoto, kappa, laser, lcr saddle, leovince, lightech, mafra, marchesini, marvic, marzocchi, matris, mivv, mra, nissin , ohlins, pbr, polini, pt, rizoma, rme, robby moto, sachs, stm, stomp, superb, suter, termignoni, valtermoto. Omnia racing special parts is in close contact with its customers, taking part to several important events: padova expo bike, national and international races, free circuit sessions. On the web, we are always associated with a direct contact with the customers, so we suggest the product that best suits their needs. This should allow our customers to feel at ease. All this has not been a decade ago, a reference point in italy; In addition, our products are in demand in Europe and in the United States. The item "kit chain crown pinion pbr ek yamaha yfm660 rle-s raptor Ltd. Blk 2004" is on sale since Monday, February 12, 2018. The seller is "omnia-racing" and is located at 80055. This item can be delivered anywhere in the world.